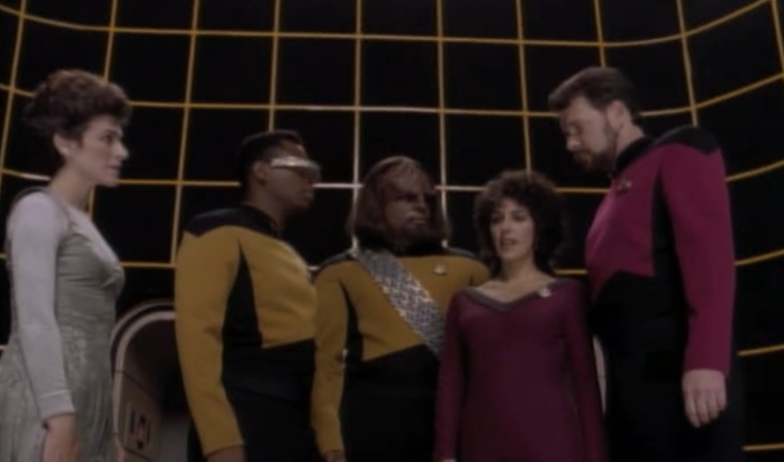 Some Kind of Star Trek: The Amazing Telepathic Holodeck: TNG's "Schisms"
The Amazing Telepathic Holodeck: TNG's "Schisms"
"Schisms" is just plain weird. 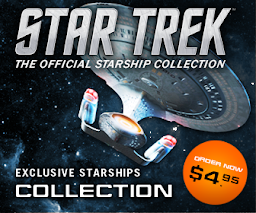 Admittedly the teleplay is from the mind of Brannon Braga but don't let that put you off. 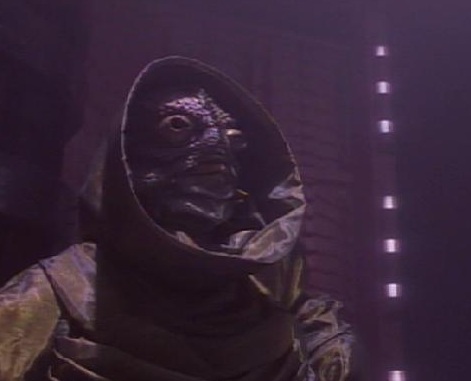 We have the infamous "Ode to Spot", some of the oddest/secretive aliens ever to grace TNG, great use of a fish-eye lens, the most subdued fade-out into the opening titles and virtually no answers. Oh - and I love it. 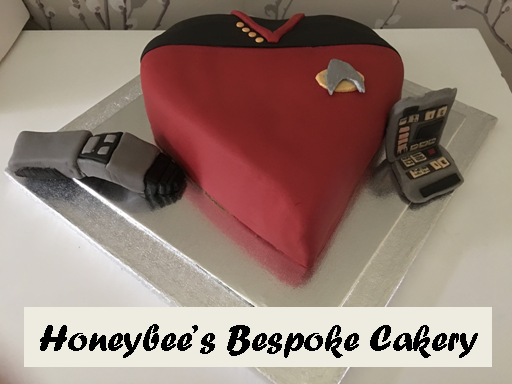 Forgot to mention that but don't let that put you off reading the rest of this blog! The pre-titles sequence is one of the great misdirections of the entire TNG run and cleverly I think this is one of this episode's strengths. It's all about build-up, what we don't see but are enticed to imagine. 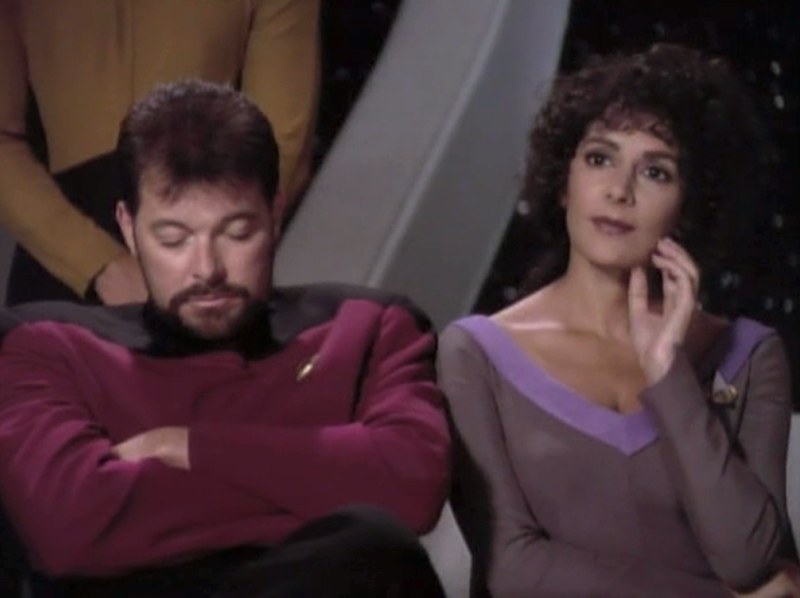 The first few minutes are Data's classic poetry recital including the aforementioned piece for his trans-gendered cat at which Riker falls asleep repeatedly as the android trundles on regardless. Played for comedy it provides no real insight into the story even though it actually sets up the whole episode through Riker's actions - not that youo would know it at the time. In many other episodes the pretitles give us some kind of hint of what to come in a much more obvious fashion to make viewers want to stay tuned. 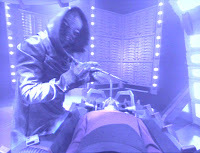 Another example where this occurs would be the season six cliffhanger, "Descent". Anyway, let's skip the plot summary and get back into the weirdness of "Schisms". While we have the investigation into sleep deprivation there's the "B" story regarding a disturbance forming in one of the cargo bays. Eventually these two tales intermix at the conclusion and that's something else a little different about this episode. Usually there's a distinct "A" story and on occasion a "B" story or even rarely a "C" thread but they stay separate and conclude individually. Also, as opposed to a lot of the other stories I have/will discussed as part of SKOST there isn't any real "theme" to the story. It's not moralistic, there's only one death of a character we never really get to know but "Schisms" is about paranoia, shadows, restlessness and mystery - and all those unanswered questions that remain, well, unanswered. It's great seeing the crew seeking some kind of explanation for their sleep deprivation and then realising that they are victims of some weird alien race. 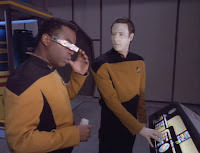 Worf has a hair-raising encounter with Mr Mott and a pair of scissors, Riker looks shattered for most of the episode (even falling asleep as we drift into the titles), Geordi's VISOR plays up (again) and even Data is affected when he loses an hour and a half for no apparent reason while in the cargo bay. 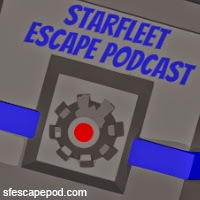 Soon it's all drawn together and the eeriness gathers several of those affected to the holodeck; now this has to be one of the best pieces of Trek ever - for potentially all the wrong reasons. 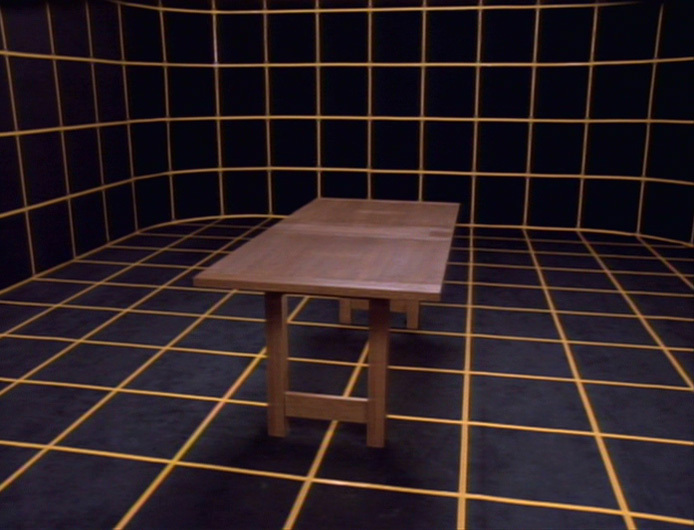 I named this blog "The Amazing Telepathic Holodeck" and by jingo is it awesome in this respect. Troi assembles Riker, Worf, Geordi and one "civilian of the week" (no doubt for budget reasons) to visualise what they have experienced or at least think they have experienced. The end result is a little off from what is seen in the aliens' home environment but that's easily explained away through personal interpretation and recollection. The really clever bit here is the speed at which the holodeck - a device not exactly renowned for its accuracy or safety all the way through TNG ("The Big Goodbye", "Elementary Dear Data","Emergence" et al) - becomes amazingly intuitive. The wooden table that is initially created gets swapped out for an inclined one (which is totally different to the original) but the best switch is when the metal table this is in turn changed for IS COMPLETELY DIFFERENT! It's now much more chair-like than table-like (see below). 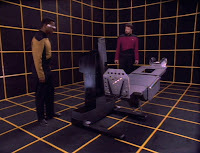 I'm guessing this is all for pacing but looking back it's amazingly shoddy that the holodeck works out precisely what table the crew want in about three moves and they then spend the remainder of the time making precision tweaks to the restraint, surgical blade and control panel. OK, I'm being pedantic and it's all easily covered but I still find it funny that the holodeck just helps out, makes its own decisions and produces a near-perfect end result in the space of minutes. What we get as a conclusion is a bit mixed although I still enjoyed it. Riker chooses to be the lab rat and get sent back into the rift but surely they would realise he's awake?! The whole point being that they're being taken when they are asleep or at the very least are made unaware that they are being secreted off the Enterprise. The aliens' environment is a bit disappointing but the fact that we find nothing definite about their reasons for their experiments keeps the mystery in place. Riker rescues Rager but that's it. We are left to muse what it was all about and whether of not this is something that will rear its head in the future. In both cases, they didn't but we are still left uneasy. 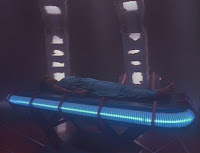 Here, in "Schisms" we are left to imagine what is going on and how the tests have been conducted (such as Riker's amputation and reattachment). 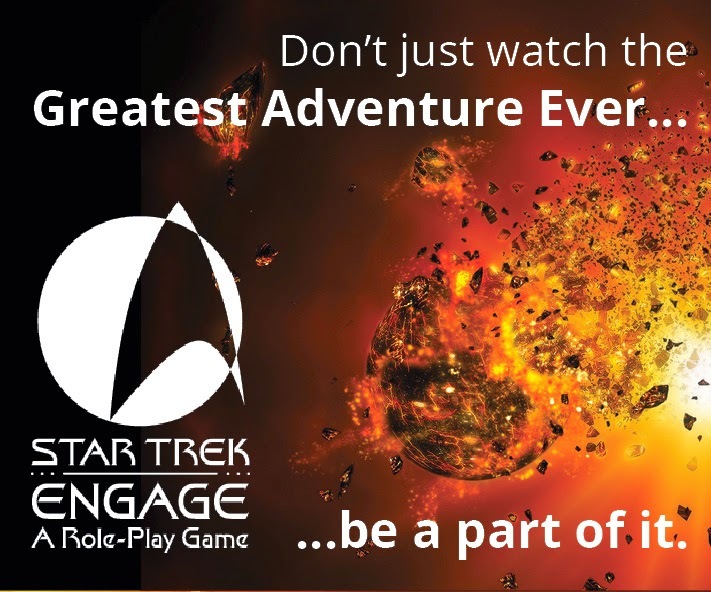 We only glimpse a fraction of Ensign Rager's experience which seems to be something to do with her blood. The instance where the crewman returns with his blood converted to a liquid polymer. It is the possibility that more could have been killed and there was very little to stop them until their actions were noted by several members of the crew that is haunting here. Even when we do see the aliens they are shrouded in the shadows and greyness of their medical chamber, hooded and wrapped from head to foot. Actually, that's another point - the masks, as seen in the superb Star Trek: The Next Generation 365 book aren't the greatest so the shadows are doing them a favour - as for the shuffly walk...what is that all about? There's no hope for them to stop Riker when he legs it with Rager at the climax. This is probably one of the more uneasy installments of TNG. The first five minutes really put the audience on the wrong foot before we get into the main story. Perhaps considering the nature of the previous season and the bulk of the episodes around it in season six it's also a little out of place. 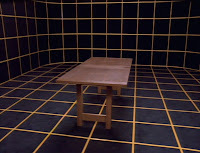 At this point in its evolution TNG was aiming more towards "intelligent" sci-fi and this does stand out because of the absence of a moral or particular character focus. It's almost as if we're having a break from the heavier story-lines that made up a large part of the later seasons. 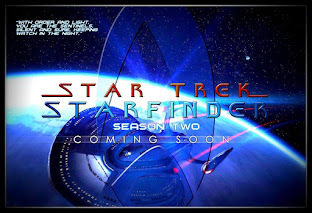 My opinion - watch it, enjoy it, but it's not likely to make it into your list of top ten episodes, or top twenty. I haven't watched it for years and so I welcomed it quite lovingly for a second/third viewing after such a long gap since it was last on my TV. Great hooded aliens, magnificent uneasiness, paranoia and probably one of the three best attempts at mild horror TNG ever produced alongside "Conspiracy" and "Genesis". Now who's up for writing the sequel? 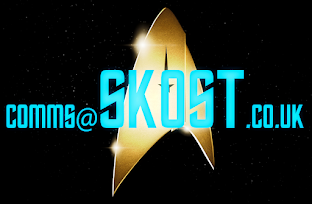 Bringing Star Trek Into Darkness?